Make in India theme makes the Army proud! 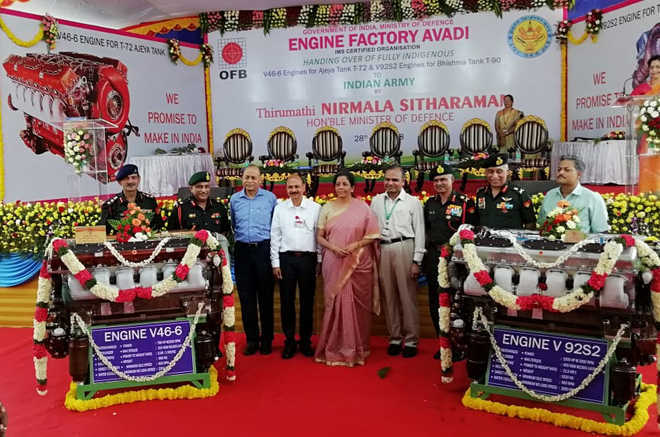 Two types of indigenously built high-power multi-fuel engines V-46-6 and V92S2 were handed over to the Indian Army for the first time under the Make in India campaign. These engines were manufactured by Engine Factory Avadi (EFA), a unit of Ordnance Factory Board (OFB). These engines are based on Russian design. V92S2 is a high power diesel engine with 1000 HP capacity and it is fitted in the T-90 Battle Tank (Bhisma Tank). V46-6 is also a high power diesel engine with 780 HP and it is fitted in the T-72 Main Battle Tank (Ajeya Tank). They are manufactured with 100% Made in India parts. The indigenisation of two of the three types of tanks used by the Indian Army has made it battle-ready. It has resulted in savings for exchequer for each engine cost to the tune of Rs. 33 lakh for the T-90 engine and Rs. 9.75 lakh for the T-72 engine. It also exhibits self-reliance of OFB in manufacturing these engines in India without any import support. Q. V-46-6 and V92S2 are indigenously built engines for which Indian Army machinery?